Produttore / Producer: Colombera & Garella is a project with Cristiano Garella, the Alto Piemontese wünderkind and leading consultant for a number of properties, with his long-time friend Giacomo Colombera, and Giacomo’s father, Carlo, who has been growing grapes in Bramaterra since the early 1990s. This property has quickly become one of the gems of Alto Piemonte, especially in the Lessona and Bramaterra growing areas. Vigna / Vineyard: In the commune of Masserano, in the Alto Piemonte DOC of Bramaterra. Soils are high-acid, reddish-brown porphyritic sand of volcanic origin, which lends a particularly mineral character to the wines. Nome / Name: Cottignano (Masserano). Quota / Altitude: 350 m / 1150 ft.
Suoli / Type of soils: Acidic pH (4.4), reddish-brown porphyritic sand from an ancient volcano. Vitigni / Varieties: 100% Vespolina. 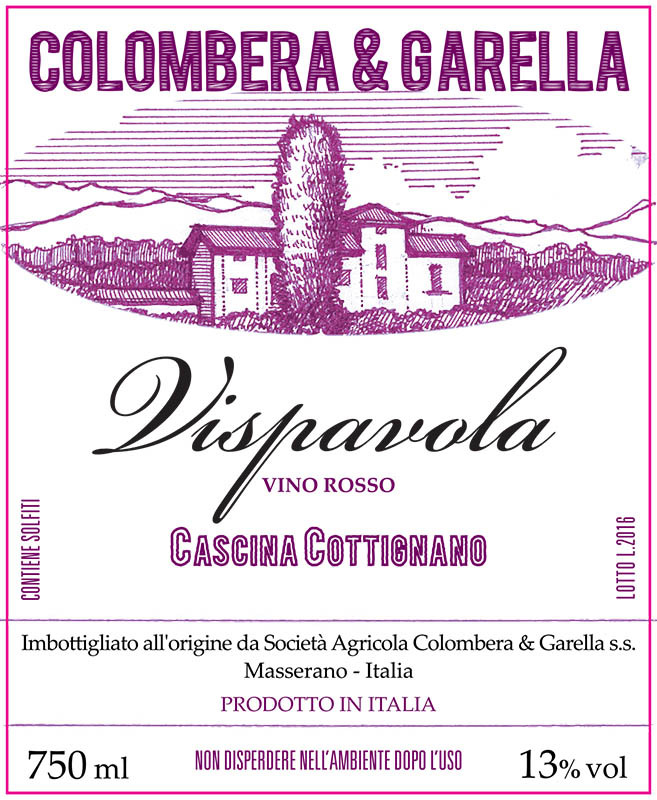 Età delle viti / Vine age: One hectare 15 years old and one hectare 40-50 years old. Densità / Planting Density: 4000 vines/hectare. Allevamento / Trellis system: Guyot. Data di vendemmia / Harvest date: Around September 15th. Metodo di vendemmia / Harvest technique: Hand harvested. Metodo agricolo / Agricultural technique: Practicing organic; copper, sulfur. Resa / Yield: 4000 kilograms / hectare. Fermentazione alcolica / Alcoholic fermentation: 10 days in stainless steel tanks, 25°C. Fermentazione malolattica / Malolactic fermentation: Spontaneous, in April. Affinamento / Élevage: 6 months in stainless steel tanks. Chiarificazione, filtrazione / Clarification, filtration: None. Zolfo / Sulphur: 50 mg/L total, 30 mg/L free. Altri prodotti aggiunti? / Other products added? : None. Produzione annua / Annual production: 1200 bottles. Gradazione alcolica / Alcoholic %: from 12% to 13%. Tappo e bottiglia / Closure and bottle: Diam cork, 750 ml Bordeaux bottle.